With an unusual sound, seemingly unearned fame, and abnormally long hair, the Beatles represented everything that critics hated about the entire rock 'n' roll genre. 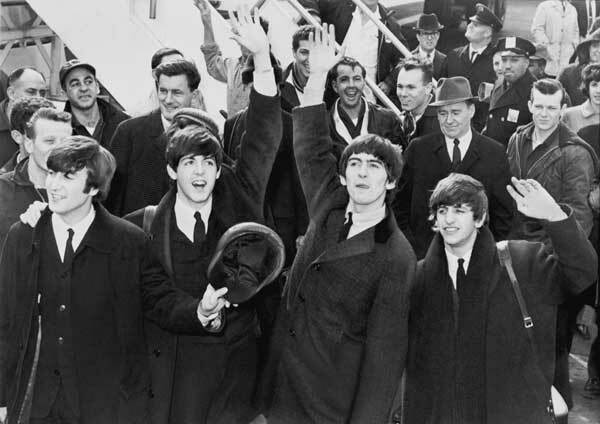 When the Beatles arrived in America 50 years ago, the media headlined stories of the 4,000 screaming fans who greeted them at Kennedy airport. In the back pages of newspapers and in television commentary, however, there were less welcoming sounds. Even before their controversial statements of later years, the Beatles had earned a sizeable crowd of angry critics. To be fair, these critics had seen decades of pop stars flash across the cultural firmament and fade into obscurity. They had watched successive waves of teen-age hysteria stirred by Rudolph Valentino, Rudy Vallee, Benny Goodman, Frank Sinatra, and, most recently, Elvis Presley. The Beatle-haters didn’t like him, either. In New York store, mom and daughter don Beatle wigs. Source: “Building the Beatle Image,”The Saturday Evening Post, March 21, 1964. It didn’t hurt that much of the new sound was “regarded by parents as nothing more than noise,” Aronowitz noted. “The sounds of popular music are not designed for the parents, they are designed for the kids.” And in 1963, these “kids,” identified by Billboard magazine as mostly 14-to 15-year-old girls, were responsible for $161 million in records sales. And all this money went to kids who had gained success without the years of hard work that parents said were necessary. The teen idols just seemed to have strolled into fame. Her sudden stardom was not unusual, Aronowitz noted. Until “The Twist” made him a household name, Chubby Checker “used to pluck chickens in a poultry market.” Dion DiMucci (“Runaround Sue,” “The Wanderer”) was a door-to-door magazine salesman. Peggy Marsh was a 14-year-old girl who sang at weddings. When a secretary at RCA Victor mistakenly heard she was an orphan, she fought to get Marsh an audition with the company’s top executives. Soon, “Little Peggy” Marsh recorded her big hit, “I Will Follow Him,” which remained number one on the charts for five weeks and brought her record contracts and television appearances. The Beatles had everything that annoyed critics of rock ‘n’ roll: an unusual sound and seemingly unearned fame, not to mention the gimmick of their long hair. But the rock group introduced a troubling new factor: a fanatical following of devoted teen fans, who gathered in larger numbers and with greater hysteria than anything seen before. It appeared that rock stars might soon have more influence over America’s youth than the adult artists who critics admired. While they were quite wrong about the lasting quality of the Beatles’ music, on this point, the critics were right. Along with the Kennedy stories (well done!) the Beatles’ anniversary really brings on such a feeling of longing for the “old days” now that I am old. Thank you for your thoughtful approach to sharing our country’s history with your readers!